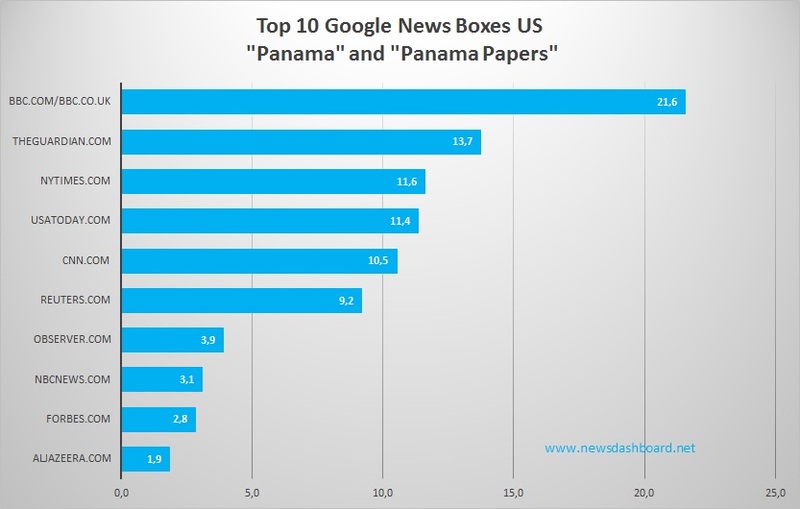 Panama Papers – Which News Publisher won the Google News Boxes in the US? The panama papers revealed many thousands offshore companies of politicians, sportsmen and criminals. One week ago a few hundred international journalists published their investigation about the Panama Papers. Of course, the public was interested in the topic as you can see in the screenshot of Google Trends US. We took a look at the news publishers which could gain a profit of it and rank most often in a Google News Box in the US. 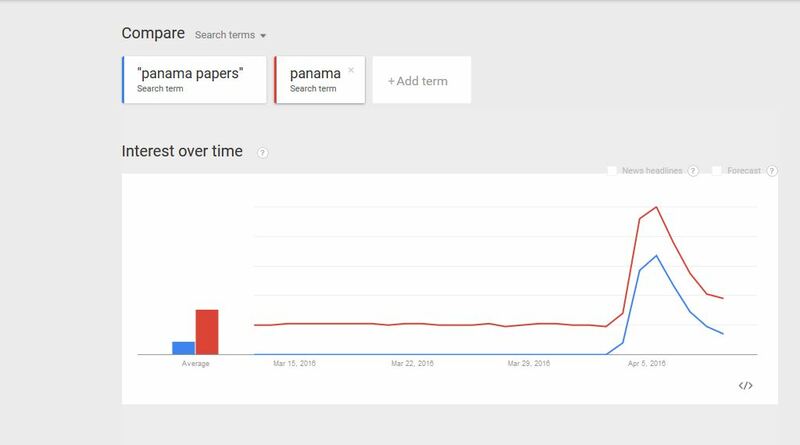 Especially in the first days after the panama papers investigation was published the search volume for the topic was high. For our analysis we focused on the keywords “Panama” and “Panama papers” between 4th and 11th of April and analysed with the News Dashboard Data which news publishers ranked in the Google News Boxes in this time interval. Surprisingly there were two British news publishers on the first two positions. Bbc.com/bbc.co.uk (we summed up the results of both URLs) and theguardian.com were on top as you can see in the diagram below. BBC and Guardian rank top in Google News Boxes to “Panama” and “Panama Papers” . Better than the established US publishers (Visibility in percent). Bbc.com/bbc.co.uk was in front with a visibility of 21.6 percent in the Google News Boxes. That is much better than any other news publisher in the Top 10. Theguardian.com “just” had a visibility of 13.7 percent. Nevertheless it is a very good result for the British site theguardian.com in the United States. On third position we find the first American news publishers. Nytimes.com had a visibility in the Google News Boxes of 11.6 percent, followed closely by usatoday.com with 11.4 percent. But it can´t be said that those news publishers are the clear winners regarding their American competitors: Cnn.com as well as reuters.com are closely behind with 10.5 and 9.2 percent visibility. Summarizing the analysis there are three “visibility levels” in the Google News Boxes for the two keywords under examination: First, there is the BBC with 21.6 percent, then there are theguardian.com, nytimes.com, usatoday.com, cnn.com and reuters.com with results between 9 and 13 percent. On positions seven to ten there are four news publishers which had a visibility in the Google News Boxes between 1.9 and 3.9 percent. Nevertheless observer.com, nbcnews.com, forbes.com and Aljazeera.com were frequently in the News Boxes so that they could assert themselves against other news publishers and got a place in the Top 10.